Whatever mothering wisdom I have has been learned the hard way. There are definitely things I would have done differently, and (thankfully!) there are also some things I feel like I did right. Things I wouldn’t have changed. 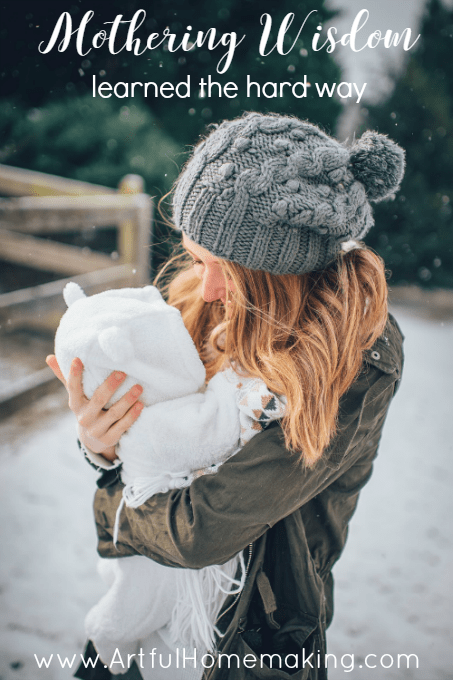 Motherhood isn’t easy, and we all need to give ourselves (and other moms) lots of grace. 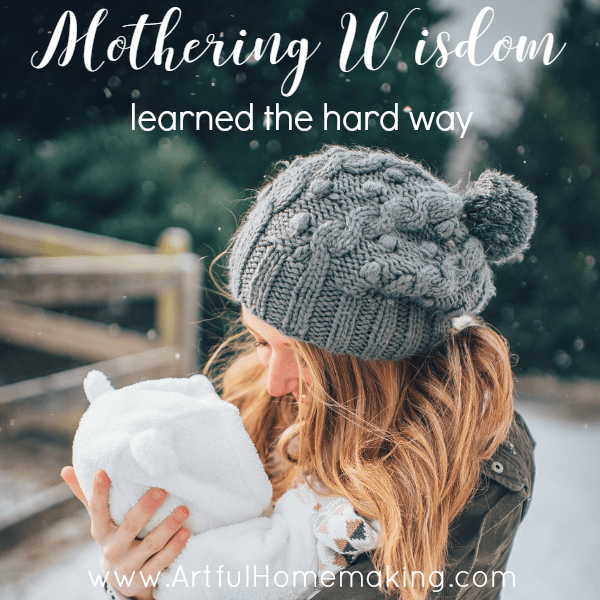 I’ve been a mother for seventeen years now, which is long enough to have made plenty of mistakes (and I have!) and also lots of happy memories (thankful that I have these!). You can learn from my mistakes! That was a great question, and there are definitely some things I would have done differently if I could go back and do it all over again. God loves my children so much more than I ever could. And despite knowing this in my heart, so often I would feel like it was all up to me. Whenever I didn’t perform the way I thought a “good mother” should, I would feel an overwhelming feeling of guilt and failure. I think many mothers place such a high standard of perfection on themselves that it’s easy to get discouraged. We can’t live up to those standards of perfection. Of course we should aim high. We should “die to ourselves,” as we serve our husbands and children. But we need to give ourselves grace. When we’re placing all the expectation on ourselves, trying to live up to our own ideals, the burden can get pretty heavy. If we’re not careful, we can crumble and fall under that burden. God wants us to rely on Him and His strength to help us in our mothering journey. He wants us to bring those questions, concerns, and difficulties to Him in prayer. He wants to give us the grace to carry out this calling and to do it well! We won’t do it perfectly. That’s an impossible standard to live under. We will make mistakes. If we trust God with our children’s lives and hearts, if we look to Him for the strength to be godly mothers, He will hear and answer that cry of our hearts. So often in my mothering journey, I’ve been desperate. Desperate for help and answers. And I felt like I needed those answers NOW. In my rush to get my questions answered, I would often turn to books, friends, or Google before I would remember to get out my Bible, search the Scriptures, and pray. I wish I would have always remembered to turn to the Lord first. Before looking in books or asking friends. In all these years of mothering, I know that the main source of my strength is Jesus Christ. As I stay close to Him, I have the strength and ability to be the mom I want to be. So, if I could go back and do it all over again, those are the two main things I would have changed. Oh, yes, I’ve made mistakes. (Just ask my teenagers! 🙂 ) But I also have some very happy memories of mothering these five beautiful people we’ve been blessed with. When I look back, I know I spent tons of time with each of my babies. I co-slept with them, carried them in slings and in my arms, rocked them, nursed them when they wanted to be nursed, and just spent hours and hours holding them, carrying them, and loving on them. I have no regrets for how I raised my little ones. And for that I am grateful. I’m so glad I decided to stay at home with my children. We have had many financial struggles as a result of having a small income, but it was all worth it. I’m thankful for the blessing of being at home with them. Reading aloud is something we started when our oldest child was just a baby. All of those hours of looking at picture books together, then graduating to chapter books, and now sharing classic stories together…it all makes for many happy family memories. As I look back on my mothering journey—seventeen years of life with these five special people who I love dearly—I see that all of the happy memories I have, and the things I don’t regret, all have to do with investing in relationships. The regrets I have all stem from the times when I chose productivity, efficiency, or self over relationship. The time that you spend investing in your children’s lives and making happy family memories is time well spent. You will never regret investing in your children! Excellent post. I, too, began my life as a mom seventeen years ago. My biggest regret is how I was so tightly wound for the first years. I wish I had relaxed a bit and enjoyed the days of having a house full of little ones. What should have been the sweetest time was my tensest time. With only one little in the house and three teens, plus a couple in between, life is still busy but with less time together at home. I’m embracing this crazy schedule knowing that it will also be over in a blink of an eye and I will no longer have big or little kids to get to activities, sports, music lessons etc. Thank you, Erin! Yes, I could have relaxed quite a bit more also in those early years. 🙂 I think that’s pretty common for many young moms. And, amen to embracing the season we’re in—it does go by so fast! Hi Joy! I love this post. So many moms need to hear this. I enjoyed the video, too. Thanks for linking at Mondays @ Soul Survival. I’m pinning on my Mondays … board and my parenting board. Blessings! Our stories are similar — especially the part about reading aloud to my kids! The best thing is that grandchildren come along and then you get to re-visit all those wonderful books again! Oh yes, the blessing of grandchildren! ♥ How nice to have that to look forward to! Thanks so much for stopping by, Michele! Oh Joy, thank you so much for answering my questions, your answers were SO helpful! I especially like how you said you will never regret investing in your children’s lives and making happy family memories. And it is a great reminder to put God first and turn to Him and trust in Him. As I’m tending to my sick family (the children all caught a yucky virus) I’m praying for strength and that I don’t catch it ☺. And I am a little curious about your time with the Amish :). Thanks so much Joy! Many blessings to you! !